Stephanie Ottimo attended Clayton State University and received a Bachelor of Science degree in Nursing in December of 2013. In the spring of 2017, Stephanie earned a Master’s of Science degree in Nursing from Brenau University. 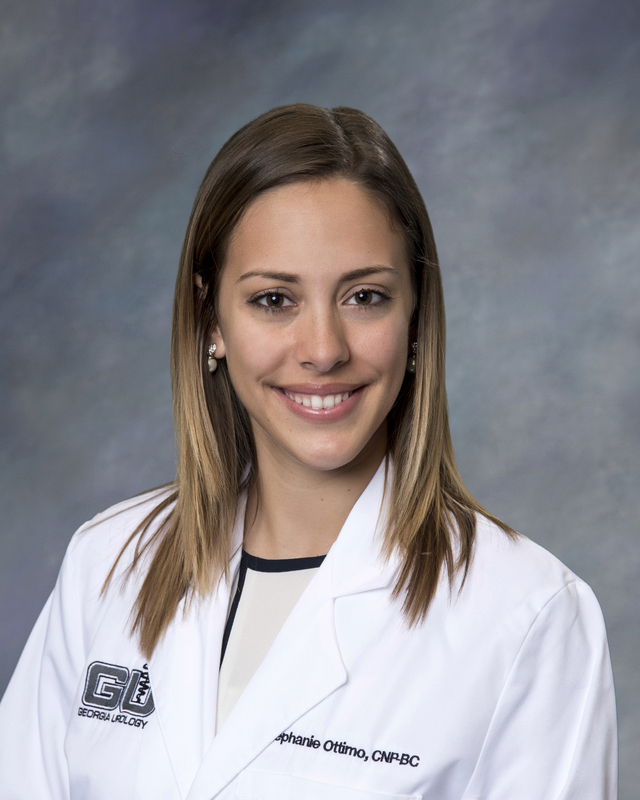 Stephanie joined Georgia Urology in June of 2018 and works out of their Glenridge and Marietta offices. Before joining Georgia Urology, Stephanie worked both inpatient and outpatient providing primary care and medical-surgical services to patients throughout the lifespan. Stephanie is board certified by the American Academy of Nurse Practitioners and is a Certified Diabetes Prevention Program Lifestyle Coach. She is also a member of The American Association of Nurse Practitioners. Stephanie is an Atlanta native and currently lives in the metro-Atlanta area with her husband and two dogs. Her hobbies outside of work include playing soccer, traveling, spending time with friends and family, and cheering on Atlanta United FC!